The all new Next Gen 25” PLUGR delivers up to 42,550 sq. ft. of aeration per hour in a single pass with core depths to 2.75”. Feature variable speed self-propelled rear wheel drive and front casters allowing speed to be feathered with fingertip control. 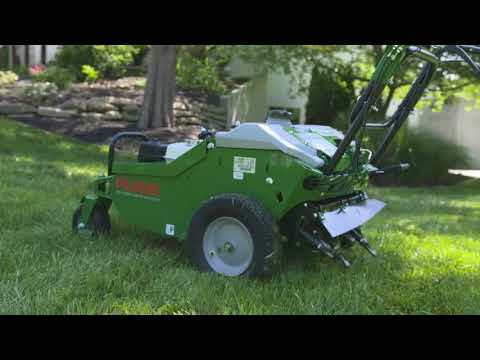 Reduces fatigue, increases productivity and provides enhanced traction while aerating on hills. Reverse feature (with tines up) for added maneuverability and ease of loading/unloading. For best in class access to inside of machine plus improved belt service access. Positioned directly over tines for better aeration depth and wheel traction in drier conditions. Full tank capacity is 40 pounds. Conveniently lifts and locks tines for transport or when reversing. When depressed, the orange lever releases the tines from the lifted locked position and engages the tining action. When released the tining action stops and the tines drag across obstacles in the aeration path for uninterrupted aeration and increased productivity. Simple, durable screw-in design makes service fast. In/out reciprocating tine motion produces less compaction on the inner surface of the hole compared to spoon designs.